so very adorable. . Wallpaper and background images in the Adam Levine club tagged: photo. This Adam Levine photo contains porträt, kopfbild, nahaufnahme, portrait, headshot, and kopfschuss. I am so happy that Adam is so happy! They are so cute ( it kinda makes me want to puke)! 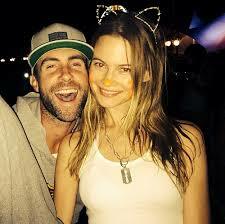 but even so, I'm still happy for Adam!